Directed by Tim Burnham. 2016. USA. 80 min. The Wedge, located at the end of the Balboa Peninsula in Newport Beach, California, is a world famous, man-made beast of a wave. Since its creation, people have flocked from all over to see it in its mythical form. Wedge waves can be as powerful as any on Earth. It is a place where injuries are common and where deaths have occurred. 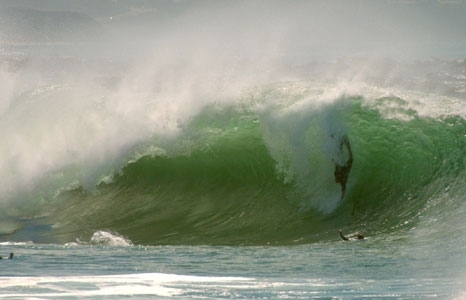 Dirty Old Wedge covers the wave’s history, starting from its creation in the 1930s. A unique assemblage of bodysurfers, which has come to be known as the "Wedge Crew" is one of the film’s focal points, highlighting their relationships with the wave and with one another. Friday, July 8: Join us for a post-screening discussion with special guests, director Tim Burnham and legendary bodysurfer Mark Cunningham. • Tim Burnham is a 33-year-old Southern California native who has been riding the Wedge (board or no board) on a regular basis for the past 16 years. He has a strong passion for the history of the Wedge and carries a strong sense of respect for those that have come before him. After getting to know and befriending many of the elder Wedge Crew members, he realized that there was an incredible story that needed to be told—not only of the wave, but of the people that ride it. Although Burnham's background isn't in film, he was able to bring the Wedge's story to life with the assistance of his extremely talented friends Jack Murgatroyd and Edwin Eversole. • Made in Hawai‘i, born in Massachusetts, Mark Cunningham has been in love with the ocean and surf for 60 years. Punahou released him in 1974 for good behavior and in 2005, he retired with 29 years of service as a lifeguard for the City and County of Honolulu. While living and lifeguarding on the North Shore, this ocean ambassador was helping and assisting locals, visitors, and international surfers in and out of the water for nearly 20 years at the world famous Banzai Pipeline. Today Mark continues to be involved in bodysurfing, roughwater swimming, lifeguarding competitions, and speaks to various community groups, spreading the love and stoke for our Hawaiian waters. Over the last several years, Mark has been creating art out of his amazing collection of “impact zone treasures” that he and his partner Katye Killebrew have found while snorkeling Hawaii‘’s reefs and beaches. Most of this art is then displayed on flotsam and jetsam gathered from O‘ahu’s windward beaches.